TENS OF THOUSANDS of Greeks poured into central Athens on Monday to demonstrate their support for the Syriza government and its call for a “No” vote in Sunday’s referendum on Greece’s EU bail-out deal. But the snap poll, called by premier Alexis Tsipras to strengthen his hand in the negotiations with the Troika of the International Monetary Fund, European Central Bank and the European Commission, failed to stay the hand of the country’s creditors and Greece formally defaulted on Tuesday. The International Monetary Fund has confirmed that it didn’t receive the €1.6 billion payment from Athens that was due by the end of June making Greece the first developed country to default in the IMF’s 70-year old history. Tsipras’ Radical Left (Syriza) coalition government has imposed capital controls and closed all the banks apart from limited withdrawals from cash machines and special provisions for pensioners. These emergency measures could lead to a “Grexit” from the Eurozone and trigger another round of bank failures across the European Union. 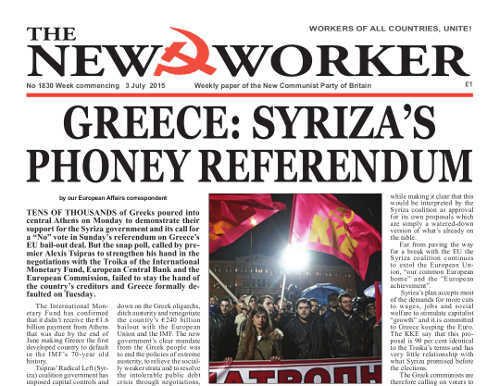 Syriza won a snap election in January by promising defend workers’ rights, crack down on the Greek oligarchs, ditch austerity and renegotiate the country’s €240 billion bailout with the European Union and the IMF. The new government’s clear mandate from the Greek people was to end the policies of extreme austerity, to relieve the socially weaker strata and to resolve the intolerable public debt crisis through negotiations, thereby creating the conditions for economic recovery and growth. But Syriza and their maverick right-wing Independent Greeks coalition partners simply carried on where the discredited old social-democratic and conservative coalition left off in maintaining the draconian austerity regime imposed by the European banks and the International Monetary Fund. DISABLED activists staged a daring attempt to invade the House of Commons last week during Prime Minister’s Questions to protest at the abolition of the Independent Living Fund (ILF). The ILF is the non-means tested benefit paid to people with disabilities in recognition that their day-to-day living costs are higher than everyone else’s. They have to pay for various appliances, home adaptations, cab fares, home help costs and so on. Its existence has allowed many people with disabilities to get jobs and lead as close to normal lives as most people. But it was abolished earlier this week to be replaced with a personal allowance to be paid by local authorities. The new Personal Independent Payments will be means tested — which means that some disabled wage earners will not get much and then no longer be able to keep up their jobs. Each applicant has to be assessed separately — a process that is expensive and is taking a very long time — leaving some with nothing while their claims are sorted out. The money given to the cash-strapped local authorities by central government to cover the costs has not been ring-fenced and could end up being allocated to other essential spending. LAST WEEK’S terror attacks have once again shown the world what President Assad is up against in Syria today. The slaughter of innocent tourists at a Tunisian beach resort, the bombing of Shia Muslims in their mosque in Kuwait and the attack on a factory in France were carried out by sectarian fanatics — followers of ISIS, the “Islamic State” movement that has been spreading death and destruction throughout Syria for the past four years. A wave of revulsion swept the world when the news broke of the brutal attacks in Tunisia, Kuwait and France. Once again the imperialist leaders are talking about the “war on terror” which in reality ends up as a war against the Arabs, as it did in Iraq, Libya and Syria. But none of them say anything about ending imperialism’s support for Syrian rebels and “regime change” in Damascus.